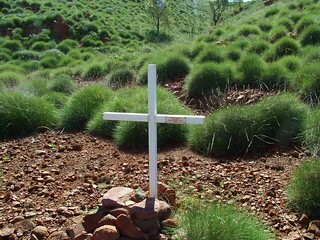 During many years of travelling the bush, I have come across the sad and lonely graves of many people. I am left pondering the tragedy that resulted in a burial in these often extremely isolated places, and I am continually amazed at the dedication displayed by those who made the effort to erect a monument. For me, this dedication is epitomised by the headstone for Fred Savory at Burrumbar. Fred died in 1901 and the headstone was erected by "his faithful mate" Bob Towers. When I first went to this site around 2000, it was hard to locate and we had GPS, air con in 4WD vehicles and cold beer in the fridge, a vast difference to the conditions in 1901. It is this "mateship" that is hard to define but is none the less an integral part of being Australian. The links below will take you to a collection of photos taken of lonely graves in the bush. It represents a very small number of those that are scattered throughout the whole state. Many have fallen into disrepair and hundreds have vanished altogether. Yet others have been restored in memory of those that perished and each one has a tale to tell, if only it could be told. It is important that these be recorded, if only for the completeness of history. These are images of graves that are not in a formal cemetery but are simply in the bush near where the departed was found. I have collected a few details about some graves of people buried in more formal cemeteries around the place. This is by no means complete and is only as accurate as the records that have been uncovered, or headstones that remain. Balla Balla Cemetery The Balla Balla Cemetery is about 18km from Whim Creek towards the coast on the old Balla Balla Road. It is a bit hard to spot, as it is overgrown. Old Broome Cemetery This is the pioneer cemetery near the beach. This link goes directly to the images. Callion Cemetery The Condon cemetery is located near the old town of Condon in the Pilbara. It is unmarked and unfenced an not generally visible at a casual glance. There are two cemetery sites at Israelite Bay, one is located east of the telegraph station near what was once Glencoe Cottage, but is a fishing shack now. The other is on the western side of the telegraph station past Dimer's old cottage and on the edge of a large salt pan. Lake Austin There are two cemeteries near Lake Austin. The first is located on the "Island" at Lake Austin, just south of the old railway station. The other, "Mainland", is north of the Island and is on the eastern side of the main road. Lennonville There are two cemeteries at Lennonville. One is on the western side of the Great Northern Highway and is also known as called Warramboo. The other cemetery is some distance away on the east of the highway, and there is nothing to mark this sad burial ground. Millie Soak Located on Nallan Station about 5km from the Great Northern Highway, just north of Cue. Nannine Cemetery This cemetery is located near the old township of Nannine, just south of Meekatharra. There is a turn off for the cemetery just south of the old town turn off on the main road to Perth. There are many graves there, but most are unmarked. Old Cue Cemetery Located just outside Cue. Payne's Find Cemetery On the new Great Northern Highway diversion around Payne's Find and directly opposite the tavern. Pinyalling The graves are near the old Baron Rothschild Mine on the way to Field's Find. Rothsay There appears to be only 4 burials at Rothsay, however, there are at least four other in the area, though I have yet to find any of these. Whim Creek The Whim Creek cemetery is on the Northern Side of the highway opposite the Whim Creek turn off. Wurarga Located in the bush under some scrub near the old railway dam 1 mile west of Wurarga.